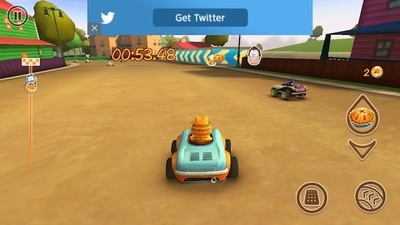 Join Garfield and the gang across 16 tracks as they race for victory. 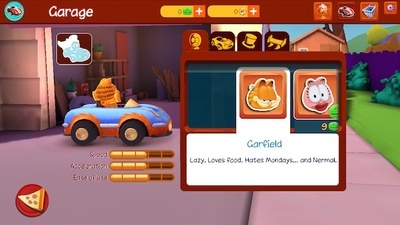 Garfield Kart: Fast & Furious is a racing game featuring our favourite comic strip cat. It is available on both Android and iOS systems, but while it is free to download from the Apple Store, on Google Play you have to pay £1.19. 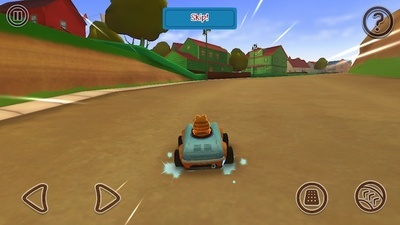 On the front of it, Garfield Karts looks like a very entertaining game, with excellent graphics. It has all your usual prank items, which you can use to give yourself a boost or deploy on your racing competitors, such a springs, flying saucers, etc. 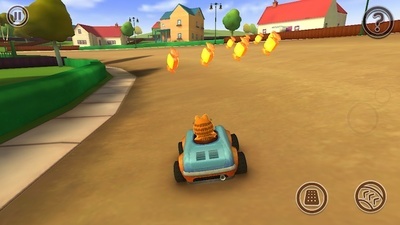 There are sixteen different tracks to race on, all from the world of Garfield. Some of these include the neighbourhood, the city, the Mally supermarket, the sunny farm, the misty docks, the oasis, and the dark manor house. 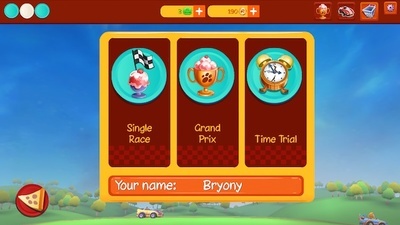 As well as different tracks, there are different three different types of races and three difficulty levels, which in total equals ninety-six combinations to play. 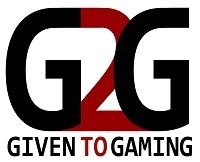 If you do manage to complete all these, you can still enjoy multiplayer mode, which allows cross-platform participation of up to five friends. 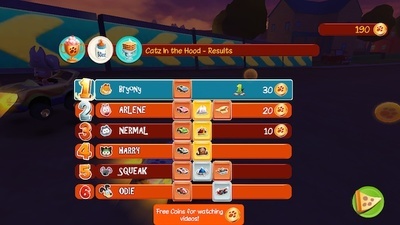 On the race tracks you can collect coins and sweets which you can use to upgrade your vehicle or unlock new characters in the garage. These don't just have aesthetic value, but also have different specifications, such as speed, handling, etc. Depending on your gaming style, you can choose which kind of controller you would like to use: tap and swipe or tilting. All these features make it potentially a very entertaining game. but unfortunately, when I put it into practice, I was very disappointed. The main problem is the view screen. Not the camera, but what actually appears on the screen while you are racing. The ads at the top are very intrusive and distracting, blocking your view of what is coming up ahead of you. I don't know whether you get ads or not in the Android (paid) version, but they are a damn nuisance on the iOS (free) app. The ads are not the only thing that gets in the way. 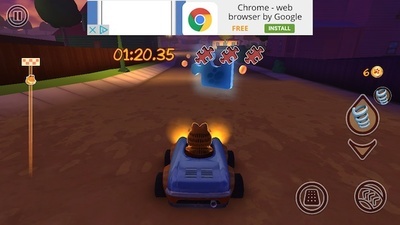 If you are on a time trial or searching for puzzle pieces, the timer/goal is displayed right in the middle of the screen, so you cannot see what is coming up in front of you (opponents, pranks, corners). 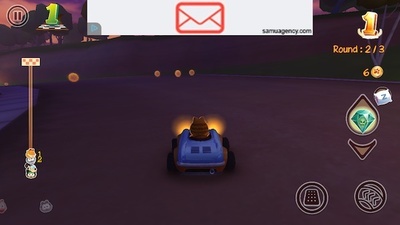 This makes driving very difficult, and ultimately ruins the game because it is so frustrating. 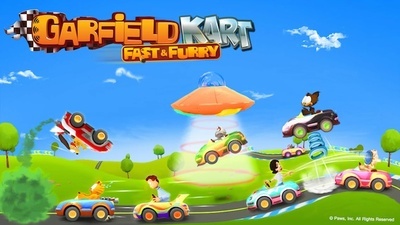 Although I would like to recommend Garfield Kart: Fast & Furry, based on its features, I can't based on gameplay.